Philips was the first company to offer a medical alert system in North America, serving hospitals and healthcare facilities since 1974. Today, Philips Lifeline helps seniors live independently and safely at home and on the go with medical alert systems that provide one-touch communication with trained representatives. With six points of mobile communication, Philips has the largest subscriber base of any medical alert company, with over 7 million people using the service. 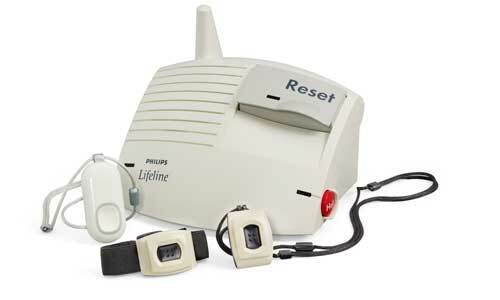 Philips Lifeline offers four medical alert systems: GoSafe, GoSafe2, HomeSafe Standard and HomeSafe AutoAlert. Each system comes with varying features like fall detection, wearable devices and two-way voice communication. Once known as Lifeline Systems, Inc., Philips Lifeline was founded by a gerontologist with the first call buttons and systems used in hospitals and healthcare centers. In the early 1980s, the company started selling to the public with an advanced water resistant alert pendant that could be used in the most common fall location – the shower. In 2006, Philips became part of the global healthcare company, Royal Philips Electronics and later the brand became Philips Lifeline. Today, Philips Lifeline offers home-based medical alert systems through their HomeSafe line of medical alert systems and GoSafe mobile alert systems. 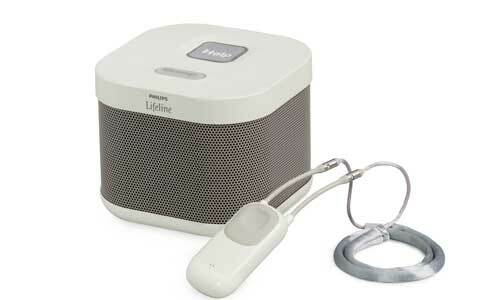 Philips Lifeline HomeSafe is a traditional home-based medical alert system with a speaker/receiver base and a wearable pendant or bracelet used as a remote panic button. The HomeSafe system is available for landlines and cellular service. The base unit, called the Communicator, uses the AT&T cellular network. A quick glance at the AT&T Network map shows excellent coverage throughout most of the U.S., except for Alaska and some areas in western states. The HomeSafe base works like a speakerphone and is designed to be loud enough to be heard throughout your house and the microphone is sensitive enough to pick up voice commands from nearly anywhere in most homes. Wearable alert buttons are available in pendant and bracelet form and are water resistant so they can be worn just about anywhere as an added layer of security. The optional HomeSafe AutoAlert system is a pendant that can detect if the wearer falls, then automatically sends a call to HomeSafe’s response center without the wearer having to push a button. The HomeSafe medical alert base and wearable alert button systems are self-monitoring and will alert Philips Lifeline should the units need maintenance or batteries need to be replaced. When a battery needs replacing soon, the medical alert system automatically notifies Philips Lifeline and a new battery gets shipped to the consumer. 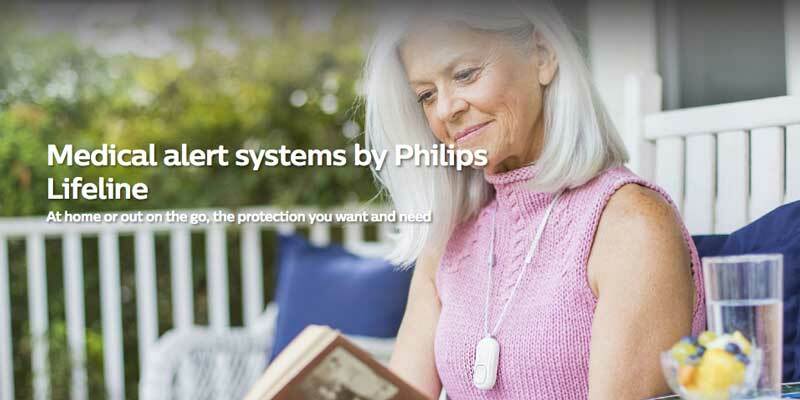 The GoSafe systems from Philips Lifeline are designed for those who frequently leave their home and want to take the security of their medical alert system with them. The GoSafe systems use GPS and a number of other technologies to locate the customer, who wears a pendant. A-GPS: Allows GPS receivers to get information from cellular networks as well as satellites to make locating the customer faster and more concise. Wi-Fi: Uses nearby Wi-Fi access points, which excel in locating customers indoors or where GPS signals are weak. Location breadcrumbs: GoSafe devices regularly records the wearer’s location and stores that information. These breadcrumbs can be used to find your location. Two-way communication: Speak to a trained representative to explain what assistance is needed and where you are. Audio beacon: Philips can send a signal to the pendant causing it to make a loud sound so first responders can easily find you. In-home communication: While at home, the pendant pairs with the Communicator base, which is paired with your address. Help will be dispatched to your home if needed. Only GoSafe medical alert systems have this sixth location technology, not GoSafe 2. The original GoSafe system comes with a base Communicator unit that works with a landline or cellular service and a waterproof pendant with an emergency button. The pendant includes two-way communication when outside of the range of the Communicator base to allow the wearer to contact the Philips LifeLine Response Center to ask for the type of help that is needed. The pendant is rechargeable and a single charge can provide seven days of service. The GoSafe pendant comes with the fall detection feature. The GoSafe 2 system consists of the waterproof pendant with built-in two-way communication and fall detection. There is no base unit for this rechargeable medical alert system, resulting in a lower equipment fee and monthly service subscription rate. Philips Lifeline operates response centers in the U.S. and Canada with multilingual operators to ensure ease of communication with consumers. The centers are available 24 hours a day, seven days a week, 365 days a year with an average response time of 12 seconds. When the emergency button is pushed on Philips LifeLine medical alert system hardware or fall detection is activated, the response center is notified and a representative attempts to make contact with the consumer. If contact is established, the trained representative will contact friends, family, or emergency services at the consumer’s direction. Should contact not be established, the staff will directly contact emergency services. Family and friend’s phone numbers are stored in the customer’s electronic records accessed by the agent. Philips Lifeline maintains an A+ rating through the Better Business Bureau with 27 complaints in the last three years, the majority of these revolving around billing disputes. With 1,269 reviews on ConsumerAffairs, Philips Lifeline has a 4.5- out of 5-star rating with most reviews speaking positively about the response center’s communication to their emergency contacts. What happens if the Philips Lifeline Response Center loses power? Philips Lifeline call centers are all equipped with backup systems to deal with power outages and other situations. If something were to occur to close down response center operation, calls are automatically routed to other call center locations so nationwide coverage is never disrupted. Do I have to push the emergency button if I have fall detection with Philips Lifeline? Fall detection is designed to automatically contact the Philips Lifeline Response Center without the consumer having to push the button. However, fall detection may not detect 100 percent of falls and customers are advised to always push the emergency button when possible if they fall. Does Medicare pay for Philips medical alert systems? Medicare does not pay for medical alert systems. However, some Medicare Advantage plans do cover medical alert systems, so contact your insurance carrier for details. Who can I designate for Philips Lifeline to call if I need help? Philips will call a friend or family member of your choosing in many situations. Philips Lifeline recommends your choice be someone who lives within 10 minutes of your home, has a key to your house, and is available to help day or night. Will I get a monthly bill from AT&T to use Philips Lifeline? No, your Philips Lifeline monthly fee includes the cellular service for your system. As we age, our bodies simply can not handle blunt force as well as they could when we were younger. Diminishing bone strength, lower fat reserves to cushion bones and organs, and reduced dexterity leading to more awkward falls all play a role in falls being more severe. Every 19 minutes, an older adult dies from a fall while every 11 seconds an older adult is treated for a fall each year. With one out of every five falls resulting in a serious injury, medical alert systems such as Philips Lifeline can be an important part of allowing seniors to maintain independence longer, especially if aging in place. If you’re interested in learning more about Philips Lifeline products, call or visit their website for more pricing information. They contact me often when I am not doing much of anything, certainly not a fall. They didn't call me several times when I fell. I was ok, though. I did contact them once when I couldn't get off the floor and I ended up, fortunately in the hospital. I was able to push the button, also fortunately. My Mom fell- it did not work, she lied on the floor for 6 hours until someone could take her to the hospital, then it's been over 2 weeks and they still have not fixed it. They said the weather has been bad. That's a ridiculous excuse for their customer service. Do not use this product. My Dad has used Phillips Lifeline for 8+ years. He is 95 years old and still lives at home. He is a huge fall risk and we went with Phillips Lifeline because of their technology with the call button that will detect a fall. It is not what it used to be. The last 2 times Dad fell it did not detect his fall. They both were in the middle of the night and thank goodness he thought to push his button. I called to complain that his button didn’t go off when he fell, thinking there might be a problem with his equipment. They tested and said there was no problem with the equipment. They said that if he braced himself as he fell it would not detect a fall, and if it did detect a fall and he moved after he fell it would not set off the system. Really? I suspect their call centers were bombarded by too many “false” fall calls so they lowered their standards. Be aware! I am looking for an alternative. Pros: The medical alert function when pushed and when a fall was done without having to push the button worked very well as hoped! Cons: NONE of the people that were on the list to be contacted were EVER called!!! Our friend was not conscious and we did not ever get word from Philips Lifeline of her fall or her whereabouts. Obviously this is not what was promised when the device was set up! This is not acceptable! Customer service was NOT helpful with this issue nor did they provide consistent information on several concerns.